Just like STC, Mobily has announced on their facebook page that the white iPhone 4 made with unicorn tears will be available in the Saudi market soon. Did you really wait for the white iPhone 4? Why? No I personally wasn’t waiting for it.. But I have a thought to share. I belive Apple focuses on Black iPhone more than the traditional whites. May be because the majority of buyers of white phones are females. And the majority of iPhone users are men world wide. Well, it’s just a white iPhone…..Apple wasn’t too smart from the very beginning; they should have fixed all iPhone white problems before launching the black iPhone that would at least allow the white iPhone to have a bigger base. 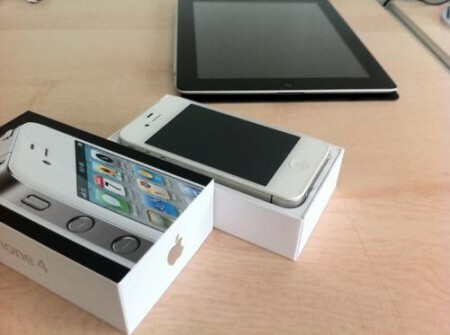 Now almost everyone is having a black iPhone 4. Who wants the white iPhone now? except for sharks? ! I mean it took them 11 months to build a white plastic phone? I mean you really believe that they could not build a white looking plastic phone? How much will it take them to build a pink iPhone? 11 years?? Unicorn tears??? Really is it actually made from that??? Did it really say that?? I believe that is ganna b out somewhere close to september. I think thats their last milking before the end of 2011. Plz remember, that i was the one who said that first on this forum. 3. Do you show all of your cards in the first move in poker? 4. seriously, i was a nokia and sony ericsson freak and didnt use apple products bcoz everything is the opposite. You even close the tabs from the wrong side. Now after using them, its obvious that it was the other guys who had us closing the tabs on the wronh side. Its the same for laptop or iphones. I think, its affordable and a complete product, dont mattet black or white. I completely agree with you Mohammed. Apple knew that iPhone4 gonna rock. They put their plants to create black one first. And they have been working on meeting the rightly forecasted demand. Starting creating White on mass is not a matter of color only. The cost of toggling is huge and must have been carefully planned (that’s what they did). FYI white iPhone is slightly thicker and the ‘death grip’ issue has been completely resolved. I used to be a huge fan of Sony Ericcson but now I feel it’s impossible to go down to something else. Apple is very smart and the Apps are really amazing. Plus dont forget, aapl.o as a stock price was at $24 in 2003 and now at $300+ they must be doing something right! !